Last month, the team from Projectcore Inc. was excited to attend the Council on Tall Buildings and Urban Habitat (CTBUH) conference. Having held conferences previously in Shanghai, London, Mumbai and Chicago, this year’s event drew delegates from all over the world to New York. With over 1200 attendees and an even longer waitlist, the annual conference is one of the most prominent gatherings of industry professionals involved with tall building design and construction in the world. An authority on tall buildings, the CTBUH conference provides a forum for the presentation and discussion of peer-reviewed studies, reports and issues related to the industry by a delegation that includes architects, engineers and real estate developers (to name a few). The moderated panels were made up of distinguished professionals speaking on a wide range of topics, such as advanced construction techniques, planning principles and building performance. 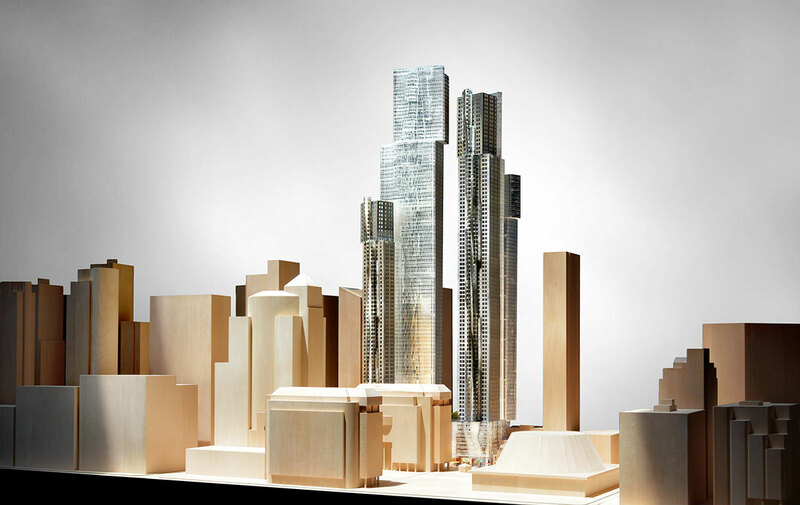 We were thrilled to see Mirvish+Gehry featured in two separate sessions at the conference and beamed with pride when the initial views of the towers elicited audible “wows” from the audience. In a panel about the planning of cities, the discussion turned to the value of negative space surrounding tall buildings and its importance within Toronto’s Tall Buildings Guidelines. Mirvish+Gehry was highlighted as a prime example of how appropriate planning of the public space between towers can enhance theirs and the city’s profile. 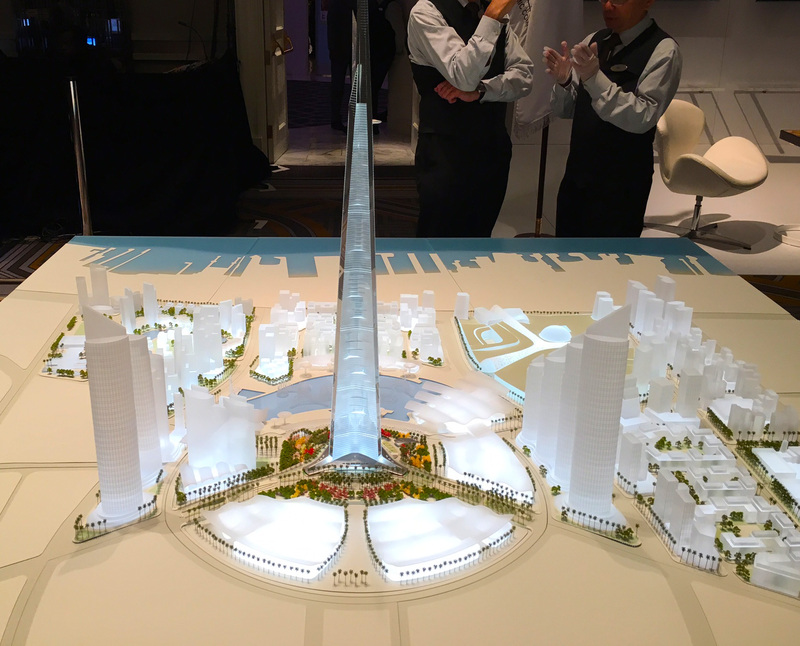 A sample of projects on display at CTBUH 2015. In a more focused session, James Parakh, the Urban Design Manager for the City of Toronto, used Mirvish+Gehry to demonstrate how tall buildings can be successfully integrated into the fabric of a city. He noted that while the distinctive architecture makes the towers a great addition to the Toronto skyline, the mixed-uses within the podiums enhance neighbourhood vitality at the ground level. Returning to the importance of negative space, Parakh noted that these spaces should be lively and animated, rather than dead zones at the street level. Also, by providing adequate distance between buildings, residents won’t feel constrained by their neighbours and will have some of their views preserved. While James cited several examples of projects in Toronto that had applied these considerations, he noted Mirvish+Gehry as a very significant project for the city. Another sample of projects on display at CTBUH 2015. The CTBUH conference is always a valuable experience those interested in or involved with tall buildings. We heard some interesting lectures, met with industry leaders and, most importantly, had the opportunity to see how Mirvish+Gehry is being received on the world stage. The inclusion of our project showed that it has garnered international interest, including eyes from the industry’s highest level of professionals. We always knew that Mirvish+Gehry was an innovative and cutting-edge project, but it is now serving as an example to developers, planners, architects and engineers all over the world. We are continuing to work diligently behind the scenes to bring Mirvish+Gehry to Toronto and events like this help us in our planning and decision making processes.